A couple of weeks ago, I took the plunge and switched to a self-hosted site as I had reached my max of GB allotted on the previous site. The choices were to either go Premium or switch to self hosting. I chose the latter as it gave me more control over my site. However in the process I may have lost a few wonderful WordPress followers. My apologies to all those who no longer see my posts in their Reader, please feel free to re-follow along if that is your wish. And a huge thanks to those who noticed and for being my second set of eyes and ears. I feel extremely blessed to be part of this wonderful and supportive blogging community! On another note….well, I know you are actually here for the recipe 🙂 🙂 lol ! If your still looking for a quick and easy holiday dessert idea which does not involve to much fussing over then I’ve got you covered! 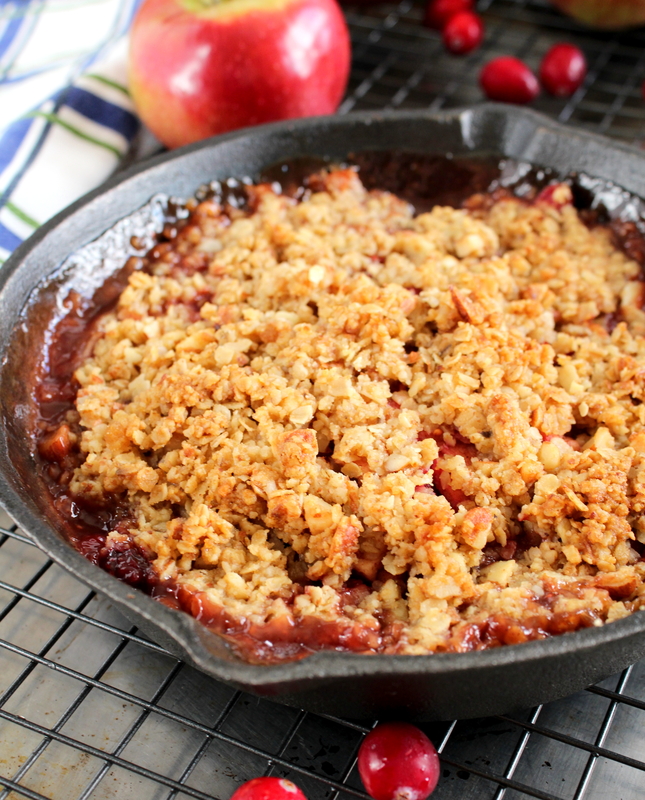 This Apple Cranberry Crisp is all that and more. 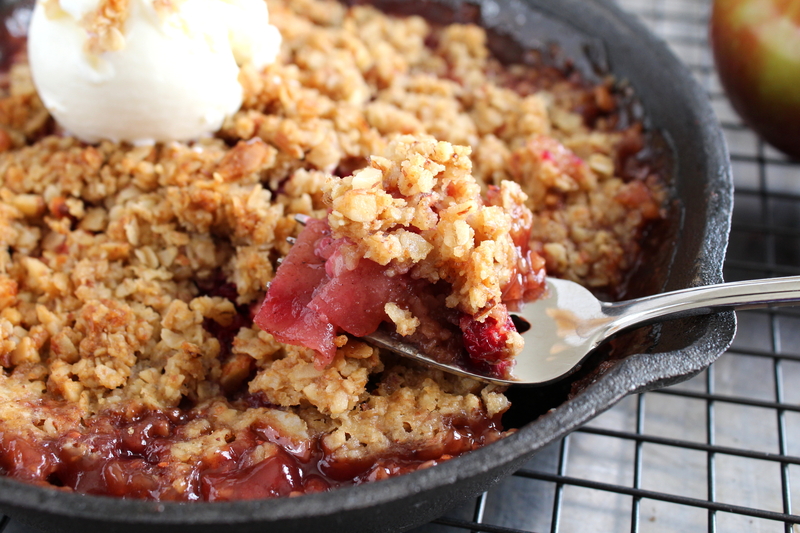 I love the combination of sweet apples paired with the tartness of cranberries and topped with a crunchy, nutty crumble…well, just heaven! You can make the topping in advance and store it the fridge for up to one week, always a plus when there are so many demands around the holidays. Normally, I would bake the apple cranberry crisp in individual, big ovenproof coffee cups, top each with a scoop of ice-cream and serve it elegantly this way. 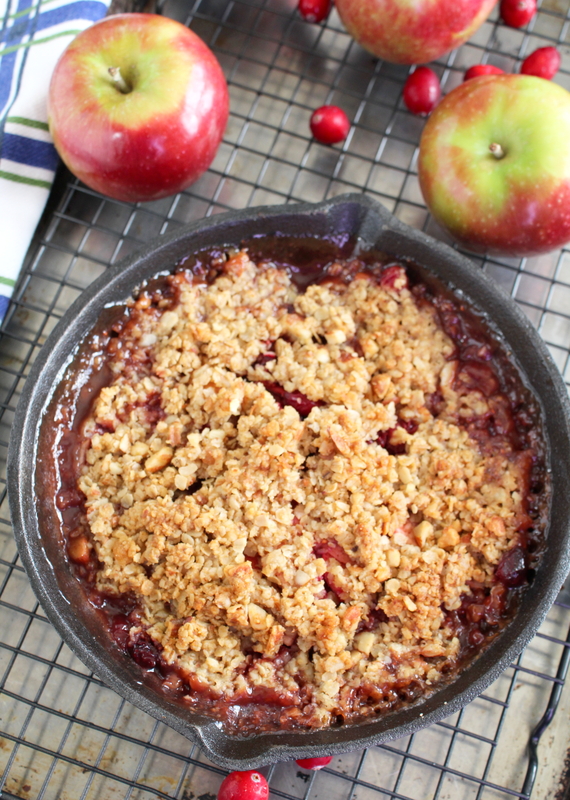 However a couple of months ago, I had invested in cast iron skillets and have just been dying to try out this crisp in a less formal way.This iron skillet does just that, giving the apple cranberry crisp a charming, rustic appeal. The filling is enough for two, 6 inch round skillets. Mound it high in the center of the pans as the mixture does cook down quite a bit. Sprinkle the topping generously over the apple-cranberry mixture, patting it down somewhat. This helps to secure it over the mixture. Serve it up with either whipped cream, English custard or vanilla ice-cream and enjoy!